This basic setup imparts rhythmic characteristics to incoming audio signals. 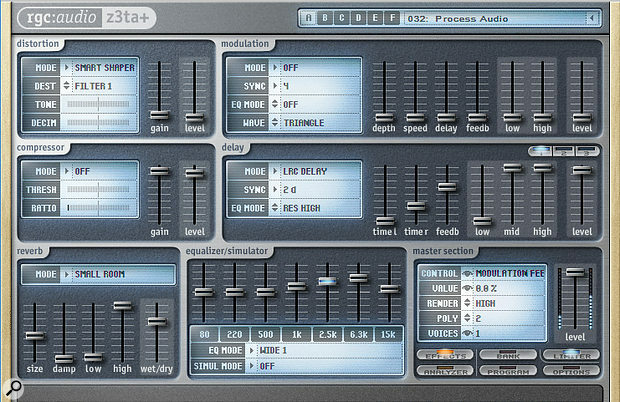 Use Sonar’s Z3TA+ synth to create exciting rhythmic effects. Many years ago, I wrote about using the Z3TA+ synth as an effects processor in Sonar. However, back then you couldn’t send a track through the filters and VCAs with envelope control (only through the effects), because you couldn’t assign a MIDI track to a VST plug-in. That limitation has since been remedied, so signal processing with Z3TA+ is a topic well worth revisiting — particularly since this versatile synth can impart all kinds of rhythmic characteristics to audio signals. This makes it suitable for many different kinds of music, but it’s particularly adaptable to any style of dance music. There are two Z3TA+ audio effects plug-ins. 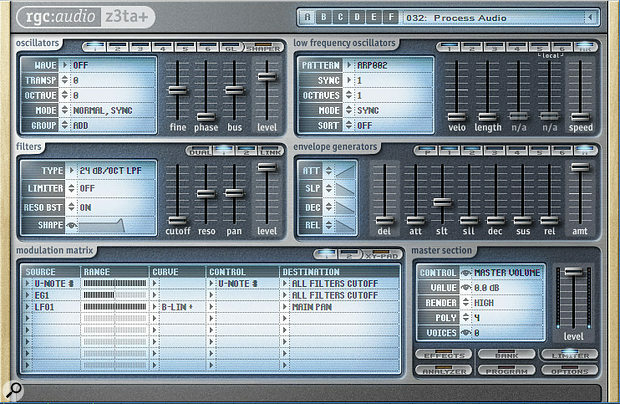 The ‘z3ta+_fx.dll’ is effects only, while the ‘z3ta+_fx2.dll’ can handle instrument inputs. As there’s nothing the effects-only one does that the other doesn’t do, and you can’t differentiate between them in the plug-in browser, the simplest solution is to open the Plug-In Manager, verify which is which by clicking on each and looking at the filename, then adding ‘z3ta+_fx.dll’ to the excluded list. Note that the original Z3TA+ is over a decade old and includes functions that hadn’t, at the time, been explored before, so it has some user-interface idiosyncracies not found in more modern virtual instruments that have since arrived at a sort of de facto standard way of doing things. There’s nothing insurmountable, but you need to get used to the terminology; for example, if a controller is identified as a ‘U+’ type, that means it’s unipolar in a positive direction. In a standard installation, you’ll find the documentation at C:/Program Files/Cakewalk/z3ta+/Documentation. Also check out the v1.5 release notes in the same folder for updated information on file paths. Insert Z3TA+ in an audio track’s effects rack. Do not insert a MIDI track yet. Instead, go to Z3TA+’s header and, under the VST2 drop-down menu, choose Enable MIDI Input. Next, insert a MIDI track and assign its input to your controller of choice, and its output to Z3TA+. If you play your keyboard, you’ll hear whatever synth patch is loaded. Unfortunately, Z3TA+’s program initialisation function doesn’t do what we need for this application, so choose a program and ‘zero’ it by at least setting all the oscillators to off and removing the modulation sources, including LFO Waves and Patterns. (Bank A, Program 032 ‘Staccato Bass’ is a good choice for a program because it’s simple, so you can zero it pretty quickly.) Also, click on the Effects button to access the effects page, set all the levels to 0, and set the EQ Mode under Equalizer/Simulator to Off. Once you’ve done that, save the program under a new name so you can call it up again in the future. To do this, double-click the program name in the header, enter a name, then click the floppy disk icon to save the program as an FXP file. The LFO has a patterned arpeggiator section, which can slice up sustained audio (like power chords, or even sustained tones and programme material) in all kinds of ways. We’ll set up a program with three modulation sources to process the incoming signal. The Z3TA+ arpeggiator triggers the amplifier, but can also trigger the other envelopes. Set up the amp envelope for a percussive sound by moving all sliders to minimum, except adjust Slt (time) for the desired amount of decay, and Amt to max. Next, choose your arpeggiation pattern. In the LFO module, click on AR then choose one of the Patterns. ARP002 is a good choice for now, but feel free to explore the other couple of hundred(!) options. Set Sync to 1, then draw a MIDI note for the duration you want the patterning to occur. If the MIDI track has a keyboard for input then enable Input Echo on the MIDI track so you can trigger the patterns, but note that they begin when you hit the note (they’re not ‘aware’ of where you are in a song), so you’ll almost certainly want to quantise your playing so the patterns end up sync’ed to tempo. To make the effect more interesting, add some filtering. Link the two filters so that you can adjust Filter 1 to edit both. Two sources drive the filter: keyboard and EG1. The keyboard is the ‘U-Note #’ source in the screenshot, but in my setup, the Modulation Matrix is also using notes as the ‘control’ element (this is normally where you’d put some kind of controller like mod wheel or velocity). By ‘doubling up’ on the keyboard modulation source like this, you can control the filter’s resonant frequency over a wide range with a relatively narrow span of keys. EG1, which drives the filter, isn’t shown in the screenshot, but it’s set the same as the amp envelope, except with Amt about two-thirds of the way up. This means the envelope generator doesn’t kick the filter to its highest cutoff frequency, so we can play notes from the keyboard to move the base filter frequency higher. The result will be more obvious if you turn up the filter resonance. Incidentally, It’s easy to transfer a group of settings from something like one envelope to another envelope, by right-clicking on the enable/disable switch for the envelope you want to copy, then choosing Copy; next, right-click on the destination enable/disable switch and Paste. For even more variety, I have set up LFO1 to control panning, so the signal drifts between the two channels. The screenshot for the MIDI Learn functions shows the LFO settings; note that you must choose a sync value (2 is a good starting point) and set Offset to the middle. Then in the Modulation Matrix section, LFO1 covers its maximum possible range, with a bipolar linear curve (B-LIN+) and a destination, in this case, of Main Pan. Z3TA ’s modulation and delay effects offer sync to tempo. Of course, the Z3TA+ effects section is still available, and some of the effects offer tempo sync... and a little tempo-sync’ed delay is always fun. The screenshot above shows an LRC Delay with plenty of feedback and some unusual EQ settings to make matters a little more lively, along with reverb and some EQ. What’s more, although the Distortion is not available when using the effects-only version of Z3TA+, it is when you’re using the z3ta+_fx2.dll. The only caution is it’s possible to make Z3TA+ get stuck in silence with extreme effects settings, particularly the modulation effects. Not to worry — simply save, close the project, then reopen it, and everything will be back to normal. Real-time control takes these kinds of pattern effects to a whole new level. You can enable VST automation by clicking the ‘W’ button, then play with parameters like the amp envelope generator’s Slt parameter to vary the decay time. 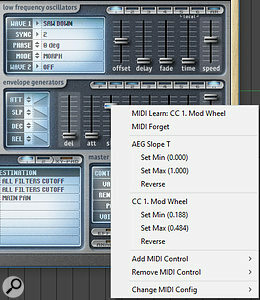 The MIDI Learn option is also extremely well-implemented. Right-click on any parameter that looks like a hardware slider, choose MIDI Learn, then (assuming Input Echo is on) move your hardware controller. But that’s not all, because it’s easy to set the range of travel the controller will cover. Move the parameter to what should be the controller’s minimum setting, then right-click on the control and under the entry for CC, click on Set Min. Next, move the parameter to what you want as the controller’s maximum setting, then right-click on the control and under the entry for CC, click on Set Max. Now when you move your mod wheel or whatever, it will cover that range. The MIDI Learn options go well beyond simple mapping. Also note the LFO settings that control the Main Pan parameter. Furthermore, you can automate and vary in real time the parameters represented by horizontal sliders such as the Range controls in the Modulation Matrix, and even the arrow-selectable options, like Filter Type. These work as expected with VST automation — however, with parameters that increment/decrement based on left or right mouse clicks, to do MIDI Learn you need to hold Shift and right–click, instead of just right-clicking. While you’re doing all this processing, remember that nothing prevents you from having oscillators (which can also be user waveforms) going at the same time. You may be surprised at how often adding some kind of tone creates a useful effect, and also, with Input Echo turned on, you can play notes from the keyboard. Despite its advanced age, and the fact that it is bundled with Sonar Professional and Platinum sans hype, Z3TA+ is a sophisticated virtual instrument. For example, did you know it has an envelope follower? And that’s not all, so spend some time with the documentation, and you might find you don’t really need to buy some cool new EDM-friendly effects processor after all, because Z3TA+ has been there all this time, hidden in plain sight.